YAY, Spring is here! 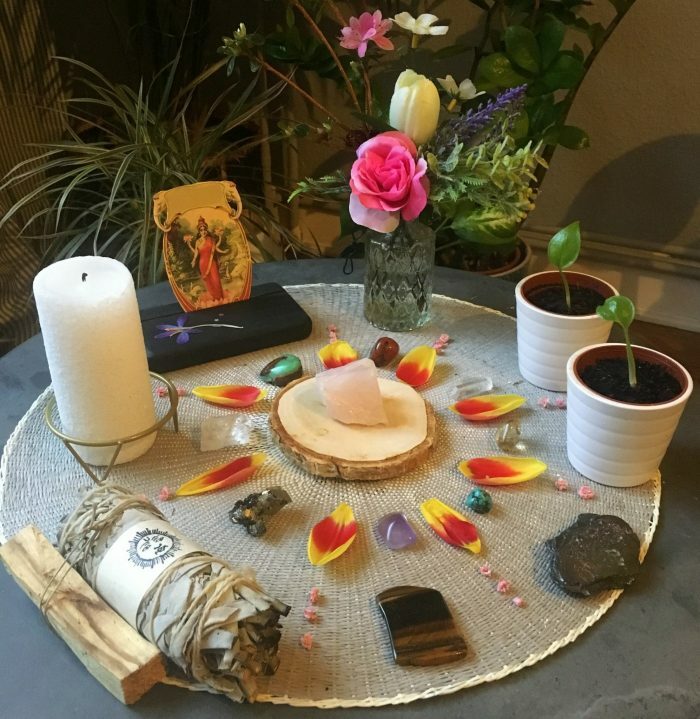 Equinox Blessings for those of you in the Northern Hemisphere – it is time to celebrate the changing Earth Cycle and embrace the energies of new life and rebirth – phsysically and spiritually! 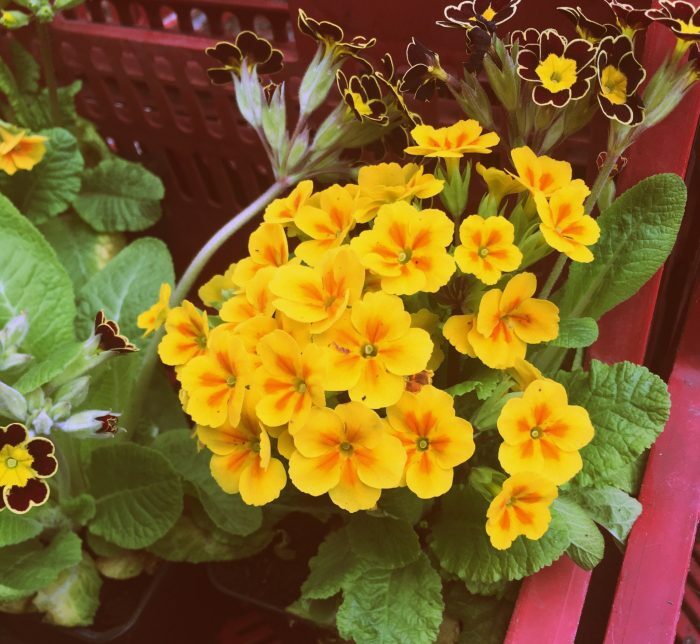 The Spring Equinox brings forth into the physical world all the inner work that has been slowly germinating beneath the surface during the long and dark hours of winter- our desires are now ready to blossom and manifest into the outer world. 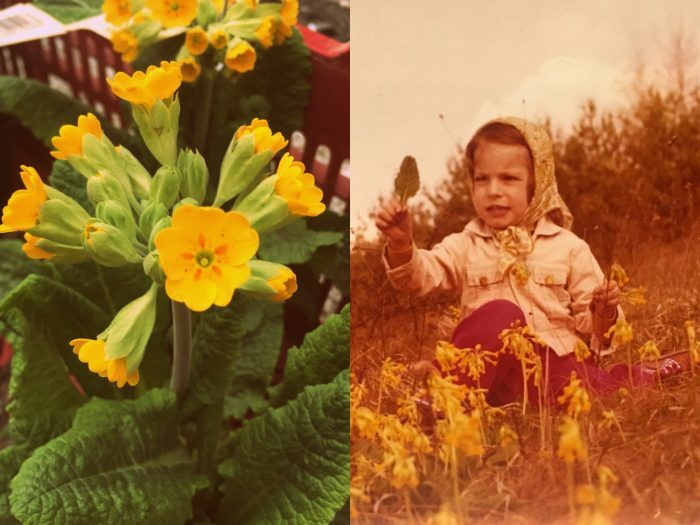 Having my Birthday in March I have always felt like such a “Spring Goddess” even as a little girl(see above), marvelling at the return of flowers, sunlight, birdsong, colors and scents. 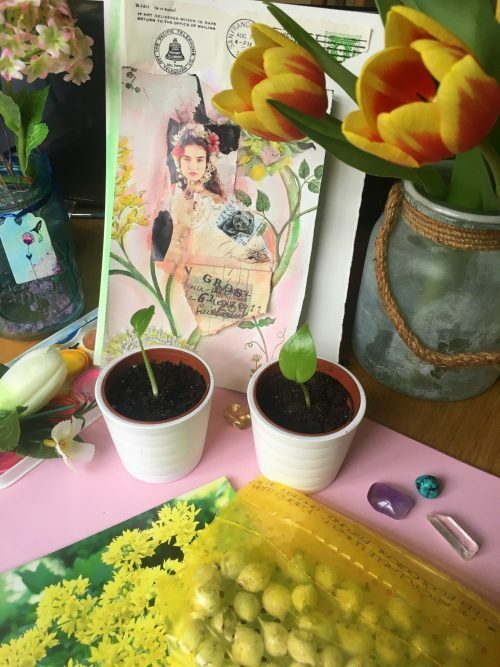 This is the time to celebrate the fertile Spring Goddess of Oestre and to honour Gaia – the Earth Mother as she awakens to new life once again. 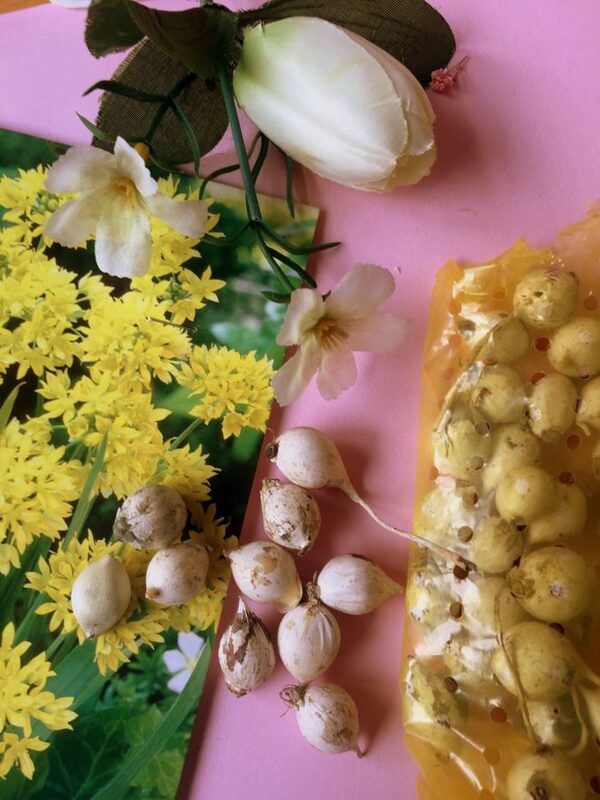 I like to honor these energies with fresh Spring flowers and pretty crystals. You can place them on your altar or bedside tabel or any corner where you like to keep some sacred items or just fresh flowers and plants. This can be a really joyful meditation, choosing and placing each item carefully and indulding in the colors and geometric forms. I also like to smudge my space with dried herbs like sage to cleanse the air of old and/or stuck energies. This is the perfect ritual in preparation for a meditation. 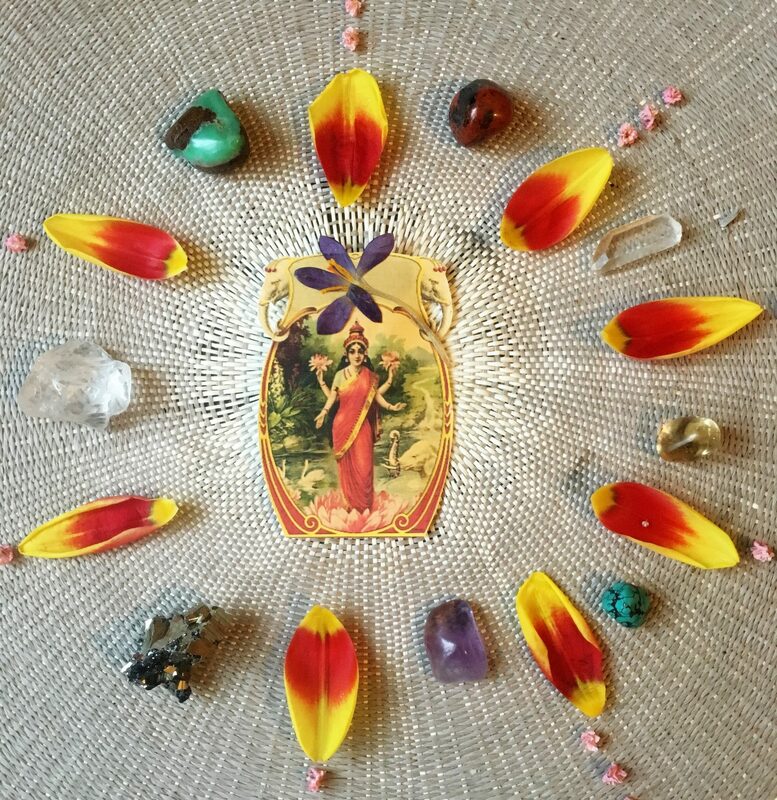 Create a simple Mandala with colorful flower petals (and crystals if you have some) to celebrate the Spring Goddess with the beauty of mother Earth. Choose whatever flowers you are drawn to. They all have their own language and beauty. Just follow your intuition and enjoy the sensuality of this ritual. To learn more about crystals and how to work with them I recommend one of my favorite books: The Crystal Muse. 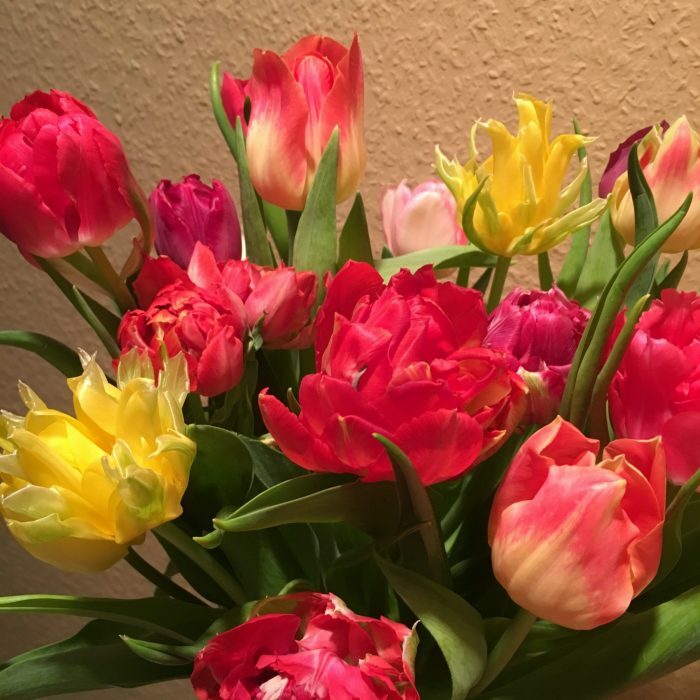 and of course some tulips…who doesn’t love fresh tulips in all those amazing Spring colors?! You do not need to be an artist or have lots of materials to enjoy this ritual of creation! Just grab some magazines, a pair of scissors and some glue. If you have crayons or watercolors, even better as you can add more color to your art work. In this example I just worked with some scrap paper and a magazine image that I felt intuitively drawn to. I glued them on a background paper with botanical drawings that I found in another magazine. Then I just played with watercolors and pastels to enhance the pastel spring colors. This was a super simple and easy collage. Why not give it a try? Let me know how it goes. I love this ritual of planting seeds. 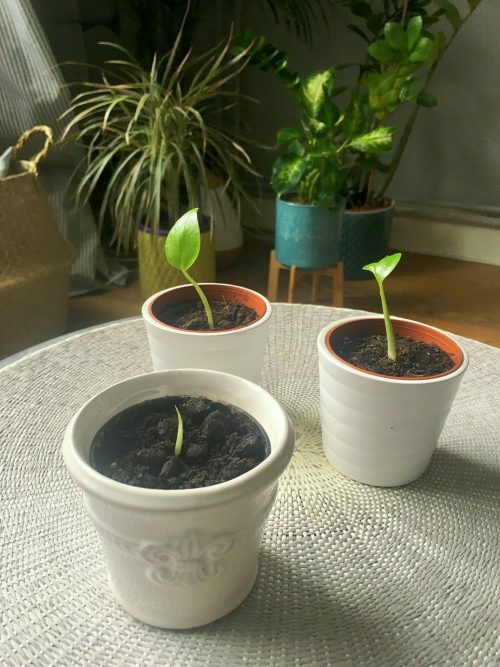 Not only is it so much fun when you see them sprouting and growing after a while, it is also a wonderful ritual for setting intentions for your life. As you put the bulbs into the soil and water them, think about what it is that you wish to manifest, to grow , to nurture ~ inside yourself and in your life. 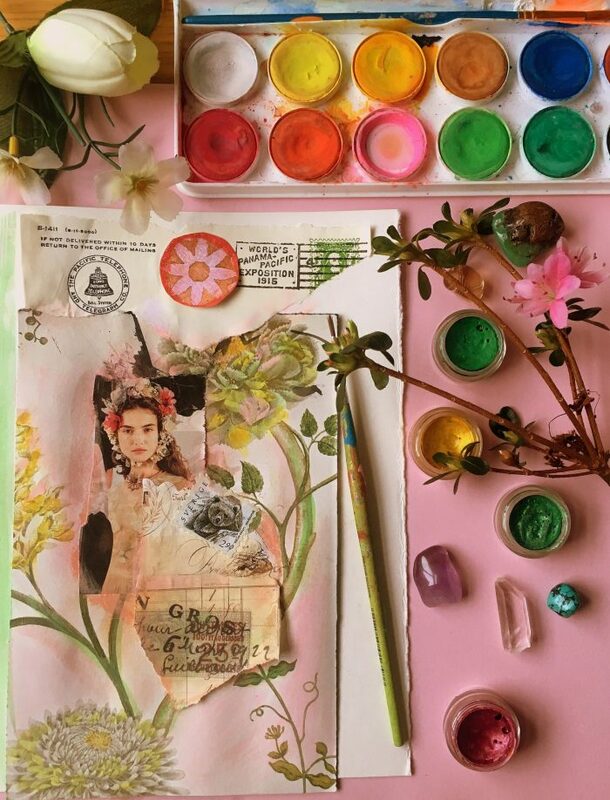 Do some journaling, dancing or painting if you like to deepen this ritual. With the warming sun and longer days we can throw off the shrouds of winter and journey forth with plans for growth and intentions just as we see reflected in nature. I planted some Monstera seeds on the new moon and look how they are growing and growing. It brings me so much joy to watch this new life emerging! This ritual is also part of my upcoming “Bloom into Spring” Workshop! go for a mindful walk and smell the new blossoms on trees and bushes, take in the scents and colors. Really take in the miracle of nature coming back to life. write down your new intentions and goals for Spring. Pick one that you want to focus on and start putting it in motion with little steps. Journal or collage about your intentions. Whatever makes you feel connected to joy and fresh new beginnings, do it!